I remember well the day of the horrific terror attacks on the United States fifteen years ago on September 11th. Still raw from the murder of our daughter Malki one month earlier, I was certain, the world would now empathize with our victimization at the hands of Palestinian terrorists. Israeli pundits discussing the attacks on TV reached the same conclusion. Israel is no longer isolated, they proclaimed. It has gained allies in its war against terrorism. The brand we are plagued with - as opposed to the rest of the Western world - is deemed the justifiable sort of terrorism that goes by euphemisms such as freedom fighters, protesters, rebels and resistance activists. 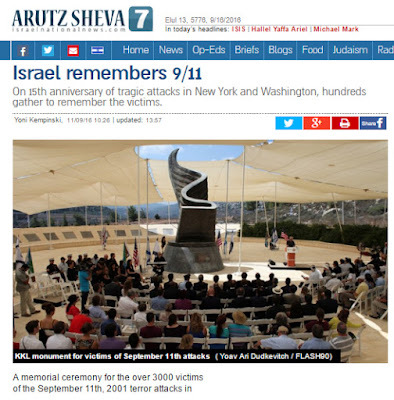 Nevertheless, as in the past, the Israeli government has chosen to commemorate 9/11 very intimately - as if we had been victims that day along with the US. That in itself is commendable. Five Israelis were among the nearly 3,000 victims of the 9/11 attacks and most Israelis feel an affinity for the American nation. Moreover, the JNF monument, called The 9/11 Living Memorial, is the only monument outside of the United States that lists the names of all the victims. What is odd - some would say deplorable - is that Israel's remembrance of 9/11 and respect for its victims has exceeded that of its own terror attacks and victims. In 2009, a memorial [see Wikipedia] listing all of 9/11's victims was erected by the JNF in Jerusalem. I was shocked to re-read what I had written about this site thirteen years ago ["No memorial, not even a plaque", Jerusalem Post, July 30, 2003]. 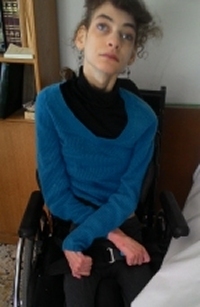 It seems the previous year, a group of bereaved parents had sent the Jerusalem municipality an attorney's letter which eventually resulted in a meeting and in an assurance that plans were already underway to erect a central memorial at the Machaneh Allenby site on Hebron Road, on Jerusalem's south side. They assured us that representatives of the families of terror victims would henceforth be active partners in all relevant decisions by the municipality. 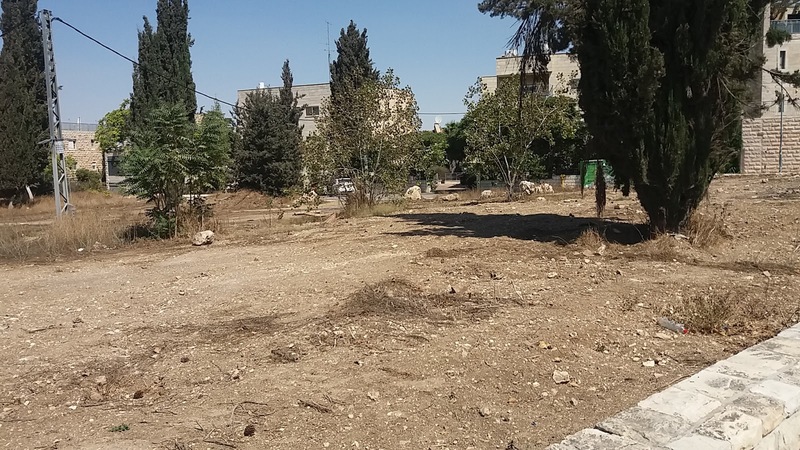 When I visited the Mahaneh Allenby site last week [nine months after that meeting] the litter had proliferated and the weeds had grown taller, but no other changes were evident... The site of this intended central memorial stands today pretty much the same way it has stood since it was originally landscaped and terraced about four years ago.... A manager in the City Engineer's office recently conceded to us that the project is headed nowhere because it lacks a ba'al habayit - an internal champion- who will promote it, raise the necessary funding and ensure it goes somewhere." The trend toward marginalizing Israel's terror victims stems from the highest echelons of power here. Otherwise, the reluctance to remember our victims in public, in full view of pedestrians and tourists, would not be so extreme and persistent. Let's all bear in mind that Netanyahu has chosen to embrace their loved ones while ignoring those of his brethren. He has demonstrated nothing but disdain for the victims of terror residing in the state he rules - treating our pleas, our letters, and our loved ones' right to justice in the context of the Shalit Deal with utter disregard. And he has certainly done nothing to promote the construction of a public monument naming all of Jerusalem's terror victims. A thousand shekels a day? !